The current fracking boom in the US has had a positive impact on the plastics industry, reducing the cost of many resins and leading to the construction of new facilities for their manufacture. But it has also placed an immense strain on the railroads. Because the fracking is generating some much petroleum products in areas that are without pipelines, the extracted liquids are shipped by rail, and so demand for rail cars is at an all-time high. And this means that any little hiccup only makes the stress on the logistics that much worse. Train derailments, especially those that lead to conflagrations are sure to be on the national news. But fracking is also also stressing the railroads in other, far more subtle ways that associated with pre-extraction activities, ways that never make the national news. The key step in fracking, the step that makes fracking all worthwhile, is the placement of proppants in the underground formation. Fracking wells are trying to extract petroleum from "tight" formations, ones where the rocks have low porosity. The porosity can be increase by fracturing the rock (hence the term "fracking") with by pumping high pressure water into the formation, but once the water is removed, the porosity drops again. Enter the proppants. Proppants are small particles, typically fine sand that is placed into the formation and keep the rocks "propped" open after they are fractured so that the porosity remains high. But just as there are no pipelines in areas where fracking is prevalent, there is seldom the correct sand in the fracking area and it needs to be brought in. For the Bakken formation in North Dakota for instance, te sand is brought in from Wisconsin. And it should come then as no surprise that the preferred mode for bringing the sand is railroads. Which is creating further demand for rail cars. Derailment of a train carrying sand is not something that will hit the national news, so all these sand shipments to support the fracking industry are seldom discussed. But that shipping that sand can create an even bigger problem for the railroads. The preferred sand is pretty fine and can leak from the rail cars onto the rail bed bellow and when wet, the sand can play havoc on the stability of the rail bed. "The big chunks of rock — crushed limestone or dolomite that engineers call ballast — that keep railroad tracks in place look like a solid footing even as freight cars rumble overhead...In Wisconsin, a booming industry mining sand used by oil and gas drillers in hydraulic fracturing has presented a new challenge: fine grains of sand can leak from rail cars, accumulate in rail bed ballast and, during a rainstorm, turn into mushy, track-loosening mud." 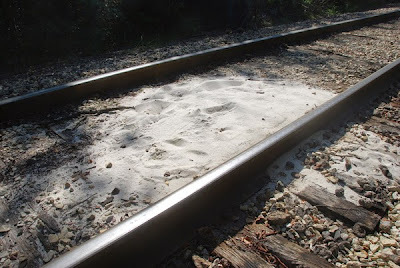 It's not just by accident that rail beds are always laid on a bed of crushed rock - it is very much be design. And adding fine sand to the mix is NOT part of the design. The page linked to above discusses some work of University of Wisconsin professors to attempt to stabilize the bed by injecting a reactive polyurethane into the spaces between the crushed rock (Look! Another tie-in to polymers!). I wish them a lot of luck. While creating a system is pretty straightforward, getting it approved for use in something as big and important as a railroad will be a long and difficult battle. Not railroad engineer will ever get in trouble for doing things the way that they have always been done before, but if a section of track repaired with a new technique fails and leads to a derailment, fire, possibly evacuations, injuries and maybe even deaths, that engineer, even if they are still in their 20's, would do well to consider an early retirement since it would place on them regardless. May 18, 2011 - I think we've beat biobasing to death, haven't we? Are Shape Memory Polymers "Plastic"? How Cheap are Recycled Plastics Nowadays?